021000Z POSITION NEAR 16.6N 96.2W. the state of Oaxaca through the day. today over the mountains of southeastern Mexico. is likely to produce life-threatening flash floods and mudslides. southern portion of the Mexican state of Veracruz. SYNOPSIS VALID 0600 UTC FRI JUN 02. 24 HOUR FORECAST VALID 0600 UTC SAT JUN 03. 48 HOUR FORECAST VALID 0600 UTC SUN JUN 04. WATERS WINDS 20 KT OR LESS. SEAS LESS THAN 8 FT.
20 KT OR LESS. SEAS 8 FT IN SW SWELL. WINDS 20 KT OR LESS. SEAS 8 FT IN SW SWELL. TO 01S120W WINDS 20 KT OR LESS. SEAS 8 FT IN SW SWELL. STRONG FROM 12N TO 14N BETWEEN 95W AND 99W. 07N TO 11N W OF 132W. .FORECASTER MCELROY. NATIONAL HURRICANE CENTER. 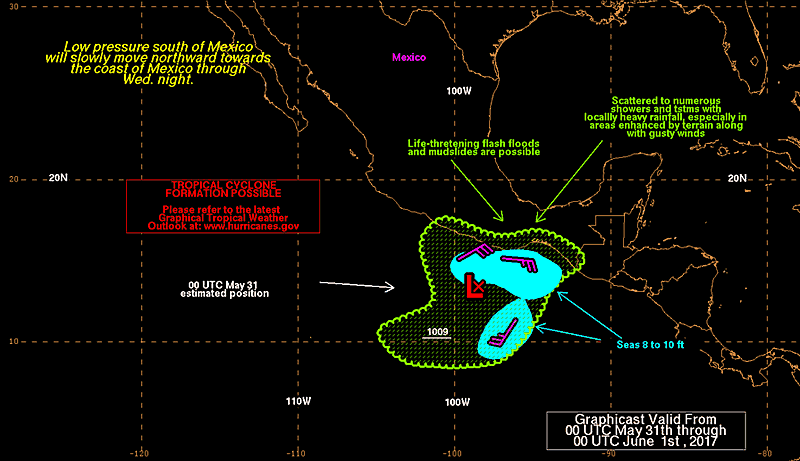 This entry was posted in NEWS, Severe Weather and tagged Beatriz, East Pacific, Maritime, Mexico, OAXACA, Pacific Ocean, Puerto Escondido, SALINA CRUZ, Severe Weather, Shipping, TROPICAL DEPRESSION, Tropical Depression 02E, Tropical Storm, Tropical Storm Beatriz. Bookmark the permalink. Tropical Storm Beatriz soaked parts of southern Mexico with heavy rains after it moved ashore in an area of touristy beach communities Thursday night and began weakening. The U.S. National Hurricane Center said the storm had maximum sustained winds of 40 mph (65 kph) late Thursday and was headed northeast at about 6 mph (9 kph). 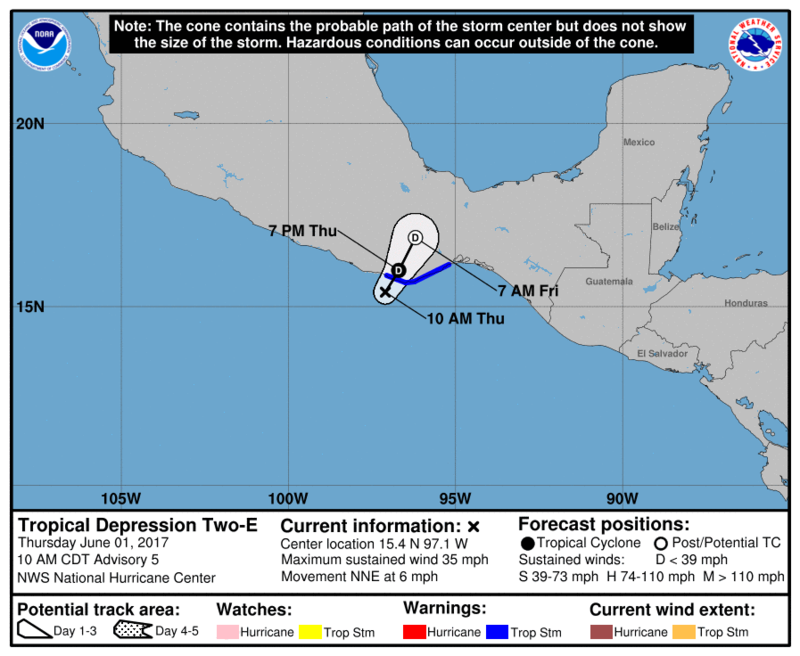 It was centered about 20 miles (35 kilometers) north of Puerto Angel and was forecast to dissipate Friday in the mountains of Oaxaca state. Oaxaca state Civil Protection authorities closed schools in the entire state Thursday, and tourists along the coast were advised to stay inside their hotels. 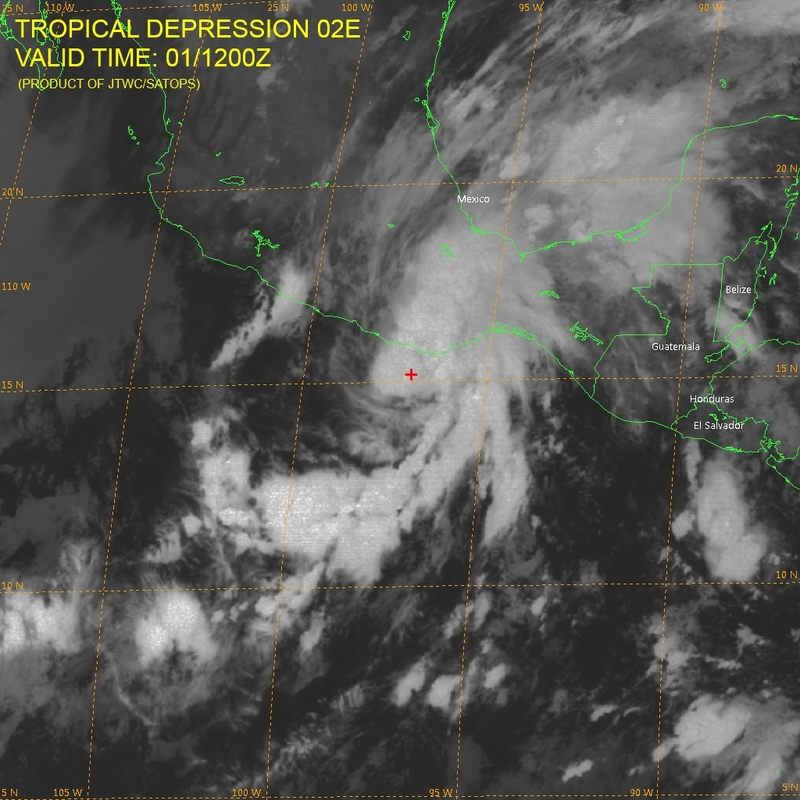 The hurricane center said Beatriz could dump 8 to 12 inches (200 to 300 millimeters) of rain across Oaxaca, with higher accumulations in spots, likely causing life-threatening flash floods and mudslides. “Heavy rainfall remains the primary threat,” the center said in a bulletin. Mexican authorities reported two slides blocking roads in the region. RSOE June 02 2017 03:46 AM (UTC).